The City Of Ten Thousand Buddhas (萬佛聖城, Wàn Fó Sheng Cheng) is an international Buddhist community and monastery founded by the Venerable Master Hsuan Hua, an important figure in Western Buddhism. It is the first Chinese Zen Buddhist temple in the United States. The city is situated in Talmage, California, Mendocino County, about 4 miles east of Ukiah, and 110 miles (180 km) north of San Francisco. It was one of the first Buddhist monasteries built in the United States. The temple follows the Wei-Yang Ch’an (Chinese Zen) school of Buddhism. The city is noted for their close adherence to the vinaya, the austere traditional Buddhist monastic code. The Dharma Realm Buddhist Association purchased the City of Ten Thousand Buddhas site, originally the site of Mendocino State Hospital founded in 1889, in 1974, and had established an international center there by 1976. The city comprises 488 acres (2 km²) of land. About 80 acres (0.3 km²) of land is presently been used and has buildings. The rest of the land includes meadows, orchards, and forests. Large institutional buildings and smaller residential houses are scattered over the west side of the property. The main Buddha hall and monastic facilities, the educational institutes, the administrative offices, the main kitchen and dining hall, the vegetarian canteen, and supporting structures are all located in this complex. Another temple known as Hsi Lai Temple, located in Hacienda Heights, a city in Southern California, has claimed that they are the largest Buddhist temple in the western hemisphere. However, as the City of Ten Thousand Buddhas has 80 acres of built-up land (with the rest as meadows or farmland), and Hsi Lai Temple posesses an acreage of approximately 15 acres, the City of Ten Thousand Buddhas is still considered the largest. The Jeweled Hall of 10,000 Buddhas: Finished in 1982, the hall is adorned with streamers, banners, lamps and is graced in the center by the presence of an 20 feet (6 m) high statue of a thousand handed Avalokitesvara Bodhisattva, popularly known as Guan Yin in Western culture. Rows of yellow bowing cushions are lined upon the red carpet. Walls are adorned with 10,000 images of the Buddha, molded by Master Hsuan Hua himself. Hall of No Words: This is where Master Hsuan Hua often held classes for his disciples in the early years of the city. The abbot’s quarters, where the Master dwelled, were on the second floor. This was also where Master Hsuan Hua laid in state during the 49-day mourning period. Now, it is a memorial hall that contains the relics of the Buddha, Master Hsu Yun, and Master Hsuan Hua. It is closed off to the public and opened on special days. 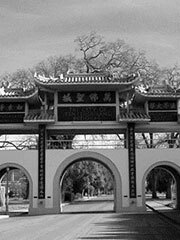 Dharma Realm Buddhist University: In order to raise the level of education among Sangha members and train people to propagate Buddhism, Master Hsuan Hua founded the Dharma Realm Buddhist University in 1976. The university aims to educate students to become wise and virtuous leaders in the world. Instead of merely transmitting academic knowledge, it emphasizes a foundation in virtue, which expands into the study of how to help all living beings discover their inherent nature. Chun Kang Vegetarian Restaurant: The university canteen. They only serve pure vegetarian food free of MSG, meat, seafood, poultry, onions, leeks, chives, scallions, and eggs. The goal is to serve healthful nutritious food full of the good karma of non-harming. Tathagata (Rulai) Monastery: The dorm rooms for monastics and guests. Bell and Drum House: Houses the instruments that are played daily to ready monastics for daily practice. Institute for the Translation of Buddhist Texts: This facility was active in the early years at the city as a center for translation and as a residence hall for nuns and laywomen. The Institute has since moved to Burlingame, California. Tower of Blessings: Master Hsuan Hua allocated the Tower of Blessings as a home for the elderly monastics residing in the city. Wonderful Words Hall: Site for daily gatherings to listen to the Master Hsuan Hua’s taped lectures in the 10,000 Buddhas Hall. Five Contemplations Dining Hall: Completed in 1982, it is where the monastics and resident lay community follow the formal monastic style in taking their lunch meal. Only pure vegetarian food is served here. Instilling Goodness Elementary and Developing Virtue Secondary Schools: The elementary and secondary schools were founded by the Venerable Master Hsuan Hua in 1976. The schools are divided into two divisions, Boys and Girls, and teach such classes as meditation, yoga, Buddhism, and World Religions. Many foreign and non-local students also reside on campus in school dorms for the duration of the school year (excepting Winter, Spring, and Summer vacations). As of Spring 2006, there were about 130 students in both divisions. Two of the distinguishing features of the City of Ten Thousand Buddhas are that unlike in many other Chinese Buddhist monasteries, the monastics always wear their kasaya sashes (long sashes that are worn outside the monastic clothing), and they eat only one meal a day and only before noon. At night most of them sit up and rest, not lying down to sleep. Monastics at the city do not have any social lives, nor do men and women intermingle. Whereas many ordinary Chinese monks go out to perform rituals for events such as weddings or funerals, none of these monks do so. Some monastics even choose to maintain a vow of silence. They literally wear a sign saying «silence» and do not speak with anyone. A rule that has gained a lot of notoriety is the offering of incense policy at the City of Ten Thousand Buddhas. Basically, no incense is ever offered by any of the lay practitioners and guests. Master Hsuan Hua believed that it was totally superstitious to insist on personally offering incense to the Buddhas, and that if many people offered incense, the Buddhas would not be able to handle the large amount of smoke. During recitation, all practitioners must keep their hands in front of their chest during circumbulations, with their right hand on top of their left. Their hands can then be in prayer position when circumbulations are over. No one is allowed to look at anyone during recitations. No one is allowed to eat before the monastics have begun eating. Flattery is prohibited. All are to refrain from praising people and never to deliberately slander anyone. No arrogance is allowed at the temple. A guest should feel that everyone else is better than him, and that he has much to learn from them. Guests are also only allowed to bow to the Buddha on one side, and not the center aisle, which is reserved for the abbot.